TWRP stands for TeamWin Recovery Project. It’s an open source software custom recovery for rooted Android devices. During installing any custom ROM on rooted Android phone, you will encounter Error 7 issue at your device. In this guide we have to discuss about the TWRP and how can we fix TWRP ERROR 7 issue at your Android phone. TWRP Error 7 status is caused while the ROM’s updater script file checks to see if the phone model of your phone is compatible with the ROM you are installing, called asserts. Asserts is a safety mechanism for installing custom ROM. You don’t accidentally install another phone model ROM to your Android phone. TWRP is helpful to install third party firmware and able to take backup of your current system. Using TWRP you can easily wipe, format, install or backup your entire system. It is a great tool fo all of those who want to modify his Android device with another updated custom recovery. TWRP Manager is a root application which allows you to quickly wipe, mount, backup, restore, install your recovery and change the settings as per your need. If your device is compatible with this option, then it should be a little bit easier and quicker mode to update your system. 1. Need an Unzip Software like Winrar, 7Zip, WinZip, etc. 2. Latest version of Text Editor Software like Notepad or Notepad++. Step 1: Extract your required ROM and open the META-INF/com/google/android folder. Here you can find file with the name of updater-script. Open this file either from Notepad or Notepad++. Step 2: Delete the lines starting from the word assert to the next semi-colon. Usually this portion is on the top side only. You have to remove the highlighted texts. So now your first line will start from mount, then Save the File. Step 3: Re-zip all the Files and Re-flash the ROM though TWRP Recovery. Now, you can check there is no more ERROR-7 issue at your device and successfully install ROM. Android Backup : Before start flash process of ROM, you must have to take full system backup. This option allows you to take full system backups on your phone. Restoring an Existing Backup: If you want to flash a ROM that which you don’t like at your device, or facing any bug issue in your phone software, then you can quickly restore from backup file. Flash ZIP Files: If you’re installing a mod, flashing Gapps or ROM, you’ll need the ability to flash ZIP files through your recovery mode. Factory Reset: If you are not able to boot or get stuck into Android OS, then you can try to boot into TWRP and perform a factory reset. Fix Permissions: During flashing ROM’s, sometimes your system can forget which permissions were granted for different apps. In that situation, this feature allows you to set everything back to the way you had them. I hope you can easily understand about the importance of TWRP. Sometime during running TWRP and installing any new custom ROM, few users faces Error 7 error issue at his device. TWRP Status 7 Error issue when the ROM’s updater script file checks to see if our mobile is compatible with the ROM we are installing, is known as asserts. Asserts is a safety mechanism which keeps a track that we don’t end up installing other mobile’s ROM on some other device. 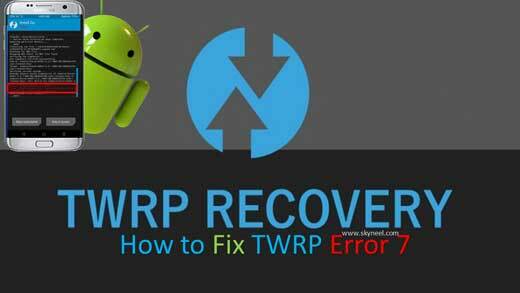 Don’t worry you can follow the given steps how to Fix TWRP Error 7 issue at your device. I hope you like this guide and easily fix TWRP Error 7 at your device. If you have any issue or query regarding this guide then please put your valuable suggestion in the comment box. Thanks to all.